Do you want to read Windows text files on your Mac? Do you need to give your Mac text file to your Windows-using friends? 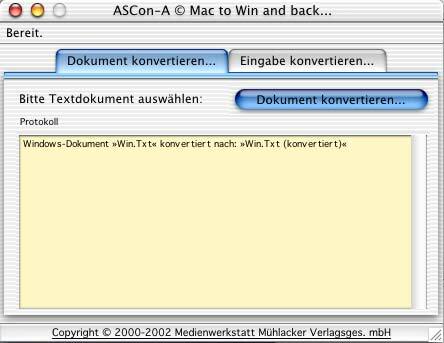 ASCon-A converts text from Mac to Windows encoding and vice versa. Completely automatic and very fast! 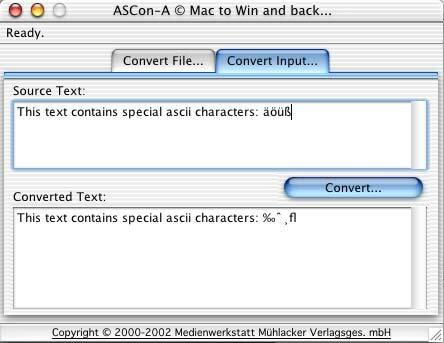 ASCon-A translates line breaks and all of the so-called "upper-ASCII" characters, including umlauts etc. into the ASCon-A program window, if it's already started. copy the text to be converted into the clipboard, start ASCon-A and choose the command "Convert clipboard"
choose the tab "Convert input", enter the text to convert into the field "Source text" and click "Convert"
Direct conversion of the clipboard contents. Special input fields for translation of passages, without using files. Specify a prefered conversion direction, or "automatic" to let ASConA see what to do! ASCon-A for Mac OS X/Carbon: New Version 2.0.2 fully supports MacOS X 10.2.x "Jaguar"
Using the integrated AppleScript vocabulary* it's easy to let other AppleScript-enabled applications use ASCon-A as a tool for converting text information between the two major computing platforms. HOW MUCH does ASCon-A cost? We allow ASCon-A to be downloaded and used for free in it's fully functional entirity - however if you decide you want to keep it we ask that you donate an amount of your choice to some organization such as the International Red-Cross to support them helping the many victims of earthquakes, flood catastrophes and hunger. Please send us a fax with the donation acknowledgement (+49 7042 810395) and we will put you into the list of registered users. As such, you will be the first to receive information on new version. You will not get "spammed" by us! Fast conversion of "Text-only" files from Mac to Windows and vice versa. Optional "intelligent" automatic determination of the source platform. Support for direct input conversion without the need to use files. For Macintosh computers with PowerPC processors. Compatible with 68K-Macs and MacOS 7.5 and up. Please use the ASCon-A support form to submit questions, bug reports and feature requests.